Stupid question: Do you remember when war was fun? You know, when North Korea wasn’t launching rockets and the media wasn’t constantly hinting at how screwed we are as a species. Well, get ready for a change and let’s make war fun again with Worms on the PS3. The newest gem from Team17 is making the jump from XBLA, where it is still weekly in the top 5 sales since launching 25 months ago, to PSN. This new “expanded and honed edition” will have additional retro-styled landscapes, graphical features & effects, 1080p support, a more responsive physics engine and four additional weapons including Super Sheep, the Concrete Donkey and, praise the Lord, the Holy Hand Grenade. 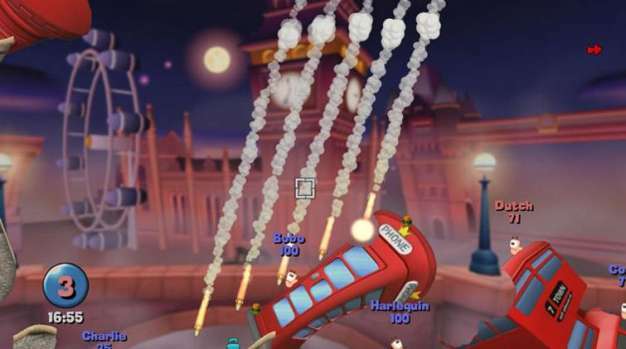 Worms brings that classic turn-based gameplay both online and off for up to 4 players. North American gamers can pick it up today for $12.99, while European gamers will have to wait till Easter weekend, or when President Obama is finished with the nuclear arms speech making, at £7.99/€9.99.